After a long day of rain the sun came out so that Dolores could enjoy the views as we traveled north to our overnight stop in Hannoverisches Münden, about two hours north of Frankfurt with a stop on the way for ‘Zweite Frühstuck,’ or second breakfast of a fresh plum tart with a tall latte macchiato at a bakery in Kirchheim, Hessen. Dolores Petit has waited at least 50 years for this trip and today it started. We will be visiting cousins in the Steinfeld (Zeven) area as well as some tourist highlights on her Bucket List. 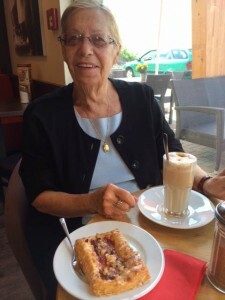 Posted in Family History Tours, Germany Tours and tagged ancestral, ancestry, dolores, genealogic, genealogy, germany, guide, guided, petit, planned, tours.